Located on the east side of the San Francisco Bay, Alameda County is one of the most vibrant and diverse counties in the Bay Area. Alameda County has everything you can ask for. Some of the highest ranking schools in the region, safe walkable communities, splendid homes and properties, thriving urban centers, and more. In 2016, Alameda County was awarded the National association of Counties Achievement Award for its continued excellence in areas such as financial stability, health care, technology and innovation, public safety, and more. Here everybody has a place to call home. There's a wide variety of properties and communities to choose from. Centrally located, it's one of the most desired locations for families and young professionals commuting to San Francisco and Silicon Valley. It's more affordable here too. Alameda County's wide array of real estate options and great location are some of the biggest reasons people choose to move here. Its diverse mix of cities and neighborhoods have something to offer for everyone. Plus, the overall median listing prices here are relatively lower than other Bay Area counties. Alameda County features a lot of recent developments and new constructions that’s easing some of the strain from high home prices. Most of the housing stock is made up of single family homes, followed by condominiums, and townhouse properties. And there's also a large number of vacant lots available. Piedmont – Both CNNMoney and Forbes rank Piedmont as one of the best places in the U.S. to live. A historic city located within Oakland, it features a charming small-town atmosphere, beautiful tree-lined streets, and the best schools in the Bay Area. It also has quick commute times to San Francisco. Emeryville – A bayside city north of Oakland's border. This small town is home to a large number of companies and serves as a regional employment center. It's got great views of the bay and features a lot of great shops, international restaurants, and entertainment centers. Dublin – Located a little further inland, the City of Dublin sits about 20 minutes from the bay. This city offers a lot of great residential suburbs and new developments that are more affordable than in other areas. It's a great place for families. Oakland – The county seat and largest city in Alameda County. Boasts exciting urban amenities including some of the best restaurants, shopping, and entertainment in the Bay Area. This city features fantastic neighborhoods and a wonderful culture. Pleasanton – Bordered by the City of Dublin to the north, Pleasanton is another one of the county's inland cities. Like Dublin, it features a more suburban feel and features a large number of available homes and new developments. Get in touch with Richard Sarro to learn more about neighborhoods and real estate options in Alameda County today. There's no shortage of things to do and places to see in and around Alameda County. 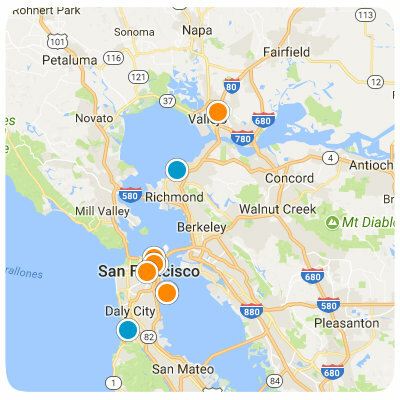 Make sure to visit at least one or two of the following places whenever you're in the Bay Area. Explore the single-family homes, condos, townhouse, vacant lots and land in Alameda County. Contact San Francisco and Bay Area Realtor Richard Sarro today.